Evaporation is a process that is utilised in countless industries, from water and food processing to chemical and metal recovery. 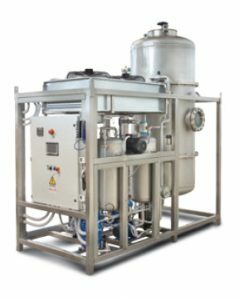 Vacuum evaporation allows this process to be carried out at reduced energy costs, and enables the process to be utilised across a wide range of industries. As experts in vacuum and air moving, EuroVacuum Products Ltd supply a wide range of vacuum systems and support to enable industrial vacuum evaporation processes. Adrienne Houston, Director at EuroVacuum Products, explores the options available to end users. Our Partner Emmecom Srl, incorporating Pf10, designs and manufactures a complete range of evaporation and concentration units. Evaporation is the process of separating matter from a solution. 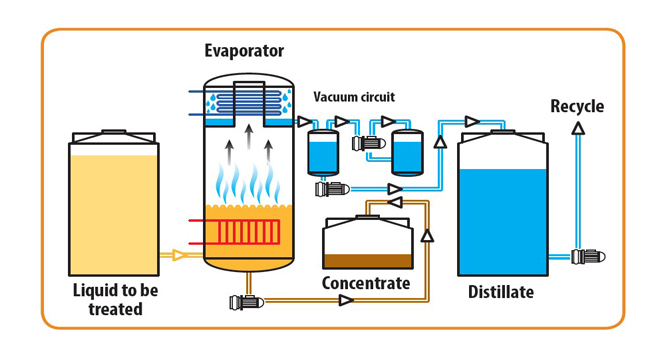 Vacuum evaporation allows the state change from liquid to gas at temperatures lower than traditional atmospheric boiling points, greatly reducing energy costs for end users. Furthermore, this method reduces the overall disposal costs of resulting elements. A large quantity of extracted substances can be recycled, plus the lower temperatures attained make the system perfectly applicable to the pharmaceutical and food industries. For example a typical process enabled by vacuum evaporation is the dehydration of egg whites, which could not be carried out at 100°C. In all cases, the aim is to extract highly concentrated substances and a high quality of distillate liquid. For the vacuum system, creating a constant automatic vacuum is the key performance factor to attain these results. Another consideration is air cooling, where a side channel blower may be required to aid the process. When specifying a vacuum system for an evaporator, maximising efficiency within client budget is the principle aim. Firstly, the requirements and specification must be assessed by a qualified engineer. Once the appropriate specification has been ascertained, specifying options such as variable frequency drives can greatly increase the energy efficiency of the required vacuum pump and the system in general. Variable frequency drives can also offer increased consistency with regard to vacuum levels due to inherent adaptability to atmospheric conditions. Ensuring pipework contains minimal corners to allow adequate airflow also boosts efficiency, as the vacuum pump requires less energy to circulate gases. This also serves to minimise potential contamination within the system, preserving the service life of the pump and associated pipework. This method can also serve to save space on the factory floor. Once installed, regular maintenance checks by a vacuum expert can ensure the system stays efficient throughout its service life, minimising downtime and extending the time to replacement.